Formerly trained in Fine Art at Buckinghamshire Chiltern University College, Susan Gray is now working as a full time artist in both Cornwall and Buckinghamshire. Endlessly fascinated by the sea, its movement, the rocks and surrounding wild landscape Susan paints directly onto boards on the beach or in the landscape. 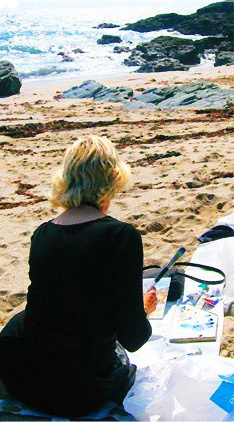 She works quickly and intuitively trying to capture the energy and emotion of the place, using acrylics or oils. These pieces can vary from small studies to large paintings which are then finished off in the studio.